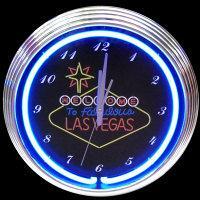 Las Vegas Sign Neon Clock 15"
High quality 3/8" diameter neon glass tubing. Battery operated clock movement. Clear glass front never discolors and cleans easily without scratching. Neon tube lasts up to 12 years, even when lit 24 hours a day. Sweep second hand. 15" diameter, approx 3" deep. 6' power cord. 1-Year Factory Warranty.